At Island Yachts Broker we have a long history in organizing boat vacations. Renting a boat in Menorca is an excellent option to get to know the island in a unique and exclusive way. Our goal is to ensure that with our help you have everything you need to make a break without worries and / or waste of time. 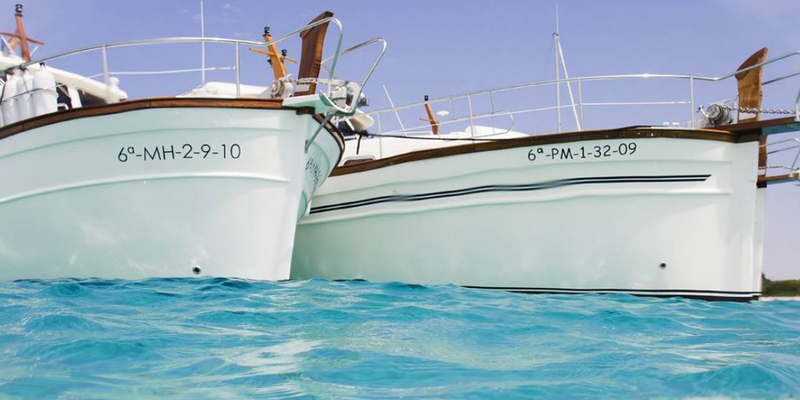 We are specialized in recreational boating, in the maintenance and management of boats and yachts, as well as in the organization of nautical events and activities in Menorca. Our experience in the hiring and organization of your vacation on board, guarantee a successful navigation and, most importantly, your satisfaction. Our rental fleet consists of a careful selection of boats that, in addition to ensuring optimal service, maintenance and state of preservation, meet essential parameters such as comfort, sportsmanship, living space, ease of navigation or equipment. We provide advice and assistance in any aspect related to your charter in Menorca..
Let yourself be seduced by the turquoise waters of the hidden virgin coves of Menorca, by the fresh breeze and the smell of the sea. Menorca is pure nature. It's not worth reading, it's not worth telling, just ... let yourself go ... Explore Menorca with Island Yachts Broker! Freedom: On a cruise, you should always share a boat with many people and assume the classic restrictions on where to go, what to do and when. However, renting a boat in Menorca with Island Yachts Broker will imply that the only people on board the yacht are you, your family and / or guests and, if applicable, the dedicated crew of the yacht that are there to serve you during your stay. Where the ship sails in Menorca, where it rests, what you eat (and when!) And how you decide to spend your vacation days will be totally in your hands! Tailored itineraries:: In Island Yachts Broker we offer you different suggestions, all of them correspond to exclusive and unique itineraries in Menorca. However, depending on the number of days of charter in Menorca, and the preferences and tastes of the client, we will advise the route that best suits your needs and start planning an unforgettable trip. We have a team of highly qualified yacht skippers who know the island of Menorca and the other Balearic Islands perfectly, so there is no itinerary to resist them. Paradisiacal beaches and really beautiful places are waiting for you! Tell us what your dream is, we will fulfill it! Comfort: We have a modern, wide and varied fleet of boats in Menorca so that each of our customers can find the one that best suits their preferences. Classic and very comfortable (Menorquin Yachts Menorca rental), fast, comfortable and design pneumatic (Sacs Menorca, Zodiac Menorca, ...), modern and highly equipped yachts (Apreamare, Charter Princess Yachts Menorca, ...), elegant motoryachts, versatile and easy to use (Cranchi Menorca, Bavaria, ...), ... etc. In short, whether they are a couple, a large family, or a group of friends, we have what you need and much more! Equipment, fun and comfort you will find on board! Catering or Chef on board: Island Yachts Broker offers the possibility of doing a shopping list. That is, the day of your shipment you can have the food, drinks and all kinds of products that may have required on board. Similarly, if you prefer, you can have a Chef in the crew to prepare delicious dishes to your liking. Nothing is impossible! Sport: Going out to surf is, in most cases, going out to have fun. Renting a yacht in Menorca will allow you to enjoy those water sports that you like, or even start in them. In addition, you can also take advantage to discover the possibilities of the so-called "toys" with which to have even more fun if possible at sea. Windsurfing, kayaking, paddle surfing, water skiing, scuba diving, snorkeling, inflatables, jet skis, Flyboard, Jetsurf, ... are just some examples. Everything you can imagine is within your reach. Entertainment: After having enjoyed a day of sun and sports, what could be better than visiting the Teatro de Maó (the oldest theater in Spain) to enjoy a musical performance or an Opera Festival, take a walk through the marine enclaves most beautiful of the island (Port of Mahon, Port of Ciutadella or Fornells), and / or go out to dinner in one of the most emblematic restaurants of Menorca, to finish then the night with good music and dancing on board? Once again, you choose. Explore: A vacation on a yacht is the perfect option to escape the hustle and bustle of everyday life, and enjoy intimacy with yours. In addition to exploring in the best possible way the spectacular Menorcan coast, its hidden coves of crystal clear waters, its colors and its beautiful surroundings, you will discover firsthand the calm and tranquility that characterize the island of Menorca and distinguish it from the rest of the Balearics. Other Services: Ask us, we have many additional services to make your stay in Menorca unforgettable. Family Holidays: With the appropriate precautions and informing children of safety regulations, it ends up being a very positive and enriching experience for them, who become lovers of the sea and boats. Renting a boat in Menorca can be an unforgettable experience for everyone. You just have to do one thing: book the Menorca boat rental with a professional company with experience. Your satisfaction is our success!